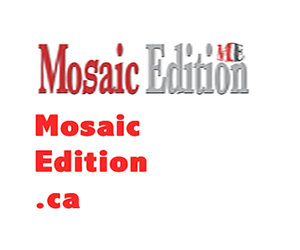 Kindly donate to mosaicedition.ca. Your donation will help the organization take care of its manpower needs, website hosting and technical costs. Mosaic Edition is a registered business since 2005. The business model of digital publishing has evolved since our inception. Our prudent management of resources for over a decade is a testimony to the fact that we will use your donation wisely. ***We do not issue tax receipts. Our passion to report on Canada’s multiculturalism is sacrosanct. It is very important for us to show the beauty of Canada’s mosaic and multiculturalism. We are in addition delighted to report in English and French, Canada’s official languages.